Oh boy! We made it to Friday and normally I would be extra excited, but I have mixed feelings about it this time! My work week starts over again tomorrow as we drive to Nashville and start setting up our "booth." I use the term "booth" loosely because it's actually a restaurant dining room that we've been working on with our vendors. If you want to see how everything turned out and follow along with a week's worth of work adventures, you can catch me on Snapchat @carylee07. But first, it's Friday so it's time for me to share some selfies lately! Let's get started! I tried the mini top knot for the first time in last week's post here, and I decided to try and make it part of my regular hair style rotation. It's definitely harder than a regular top knot, for sure! Almost like I'm trying to pull a bun together for a 3 year old. But anyhoo. I threw this outfit together because I loved the color combo. It reminded me of this outfit I blogged back in the day here. (Ooh, it makes me batty how bunchy my pants are at my knees in that blog post. 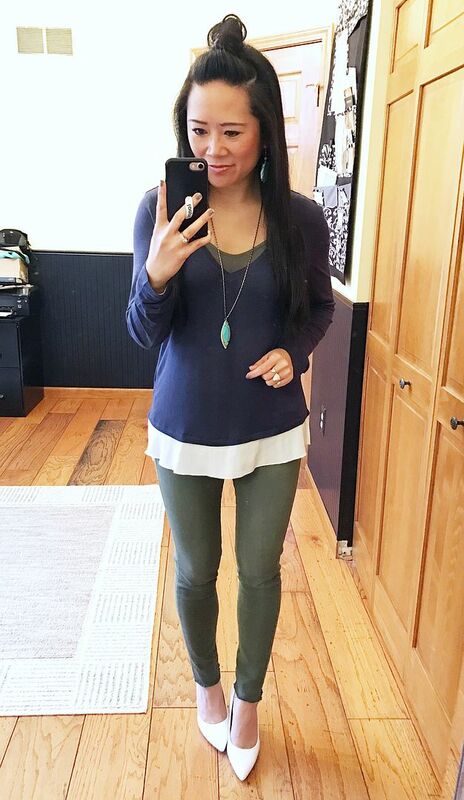 These olive skinnies I have now fit a lot better...) This top is from a Nordstrom Anniversary sale about 3 years ago! It's still a survivor in my closet, which I love! Scarf: Express | Sweater: Halogen | Vest: JCrew Factory | Bottoms: Zella | Booties: Free People "Hybrid"
I threw all these layers on in the morning, but by the end of the day, I ditched the scarf and the vest because it was in the 70s. It is SO FREEZING in the house because it's too warm for the heat but it's too cool for air conditioning, so when we wake up, it's often in the upper 50s, low 60s. 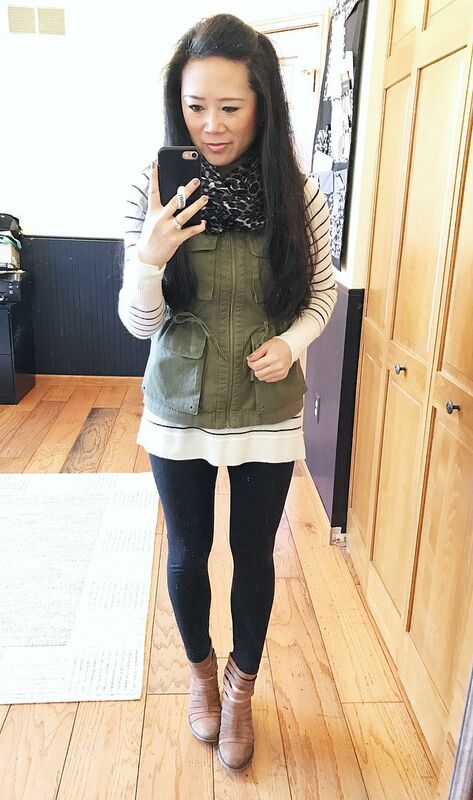 It messes with my brain, and I end up throwing on all the layers like this just to realize it's freaking summer outside. Haha! Oh well! 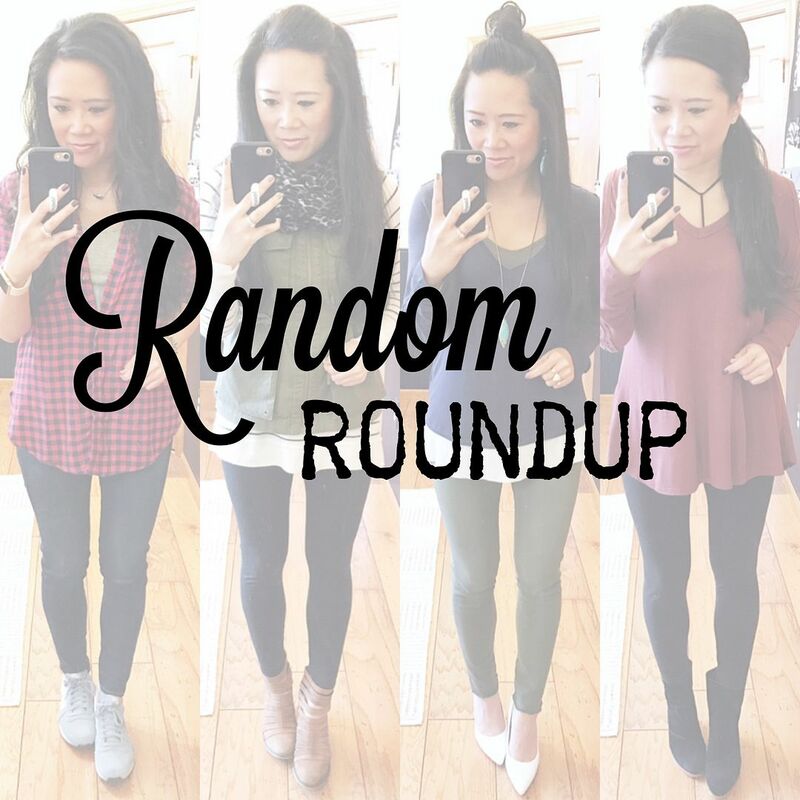 If you haven't snagged these booties on sale yet, you may want to! I swear they are magical! Since they have the cut outs, I don't wear any kind of sock with them, but somehow someway, my feet do not sweat in them! It's awesome. Bralette: Express | Tunic: Grace and Lace "Timber" tunic | Bottoms: Zella | Booties: Matt Bernson "Brooklyn"
Admittedly I've been wearing leggings to work A LOT. Mainly because I go to Pilates right after work on Mondays and then I have my lunch time class on Fridays. I've been wearing leggings so that all I have to do is swap out my top for a workout tank. It saves so much time, but I do feel bad that 2 of the 5 work days I am in leggings. -_- We'll see how my real life to workout attire changes as the weather warms up. Also, this is the same tunic I wore in Friday's post here. 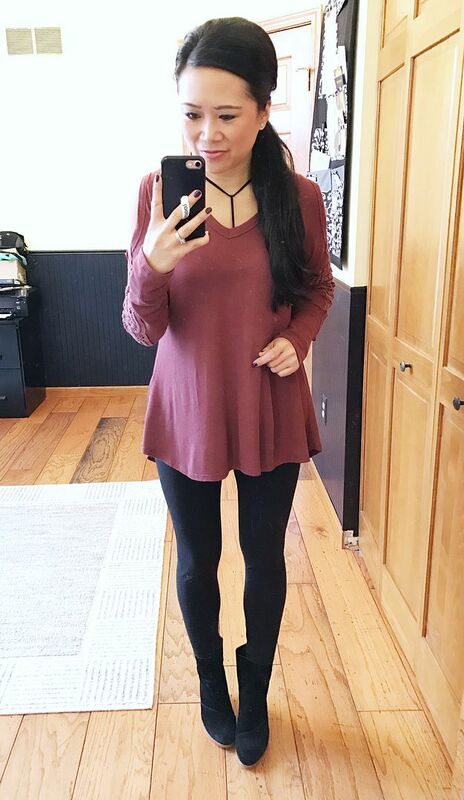 You can see how it's the perfect length with leggings! I mentioned last week that I've been trying to coordinate a photographer shoot. Well, I managed to get everything scheduled with contracts executed hours before the shoots took place. (We had one going on in Chicago the same time I was at the one in Jersey.) The shoot was from 2am to 10am because we wanted to make sure we shot while there were no customers, but then also have some with natural day light in the early morning. It was a lot of fun, but my sleep was definitely thrown off for a couple days! I was torn on what to wear. The last time I did this, I was just in workout clothes, but since I would be there while the restaurant was open, I figured I should at minimum wear jeans. I almost wore flat boots instead, but am glad I just opted for the sneakers at the last second! That's all I have for you today! I have so much stuff to do from now until I leave in the morning!!! Wish me luck! good look with everything your schedule is a doozy. 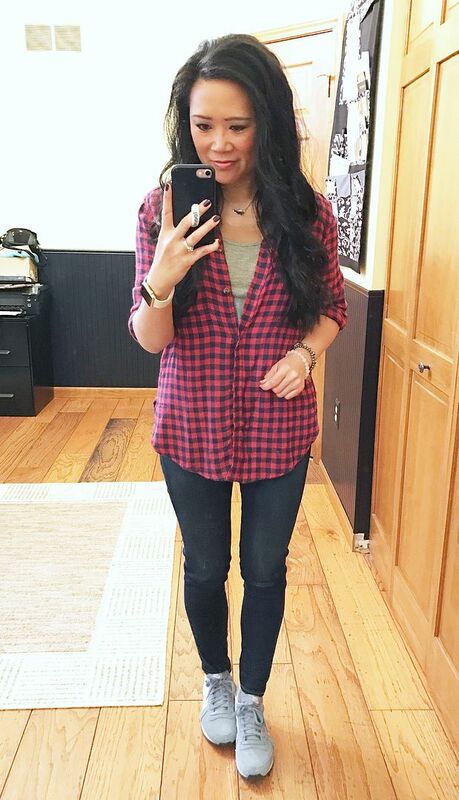 Love all your outfits as always. Good luck today! And this weekend...and next week! You are too busy right now! But at least your busy-ness gives you an excuse to wear a fun variety of outfits!